Extremadura, your holiday destination in Spain. Natural and cultural highlights. Extremadura is one of 17 autonomous regions in Spain. It’s size is comparable to Switzerland, but with around 1,2 million inhabitants the population is much lower. About 30% of the territory consists of fields with cork oaks and holm oaks which are used for small-scale livestock farming. For centuries cows, bulls, goats, sheep, and pigs have grazed these fields. The rest of the territory consists of mountains, steppes, (artificial) lakes and residential areas. Extremadura’s population largely consists of agrarians. Over the years they have developed a way of working that is tenable in the climatological circumstances of the environment. Extensive live-stock farming and agriculture is still normal in large areas of Extremadura. There are no problems with bio-industry here. Traditionally, farmers led their cattle via special roads, the via pecuaria. They leaded their animals to the lands that contained the most food at that specific moment. They would be away from home for months at a time for this. This does not happen anymore, but the regular relocation of cattle to give the soil a chance to recover is still very common. Meeting a farmer with his cattle on the road is a relatively common occurrance here. Although Extremadura sounds unfamiliar to a lot of people it is a classic destination for birdwatchers. Especially the high density of birds of prey attract them from all over the world. 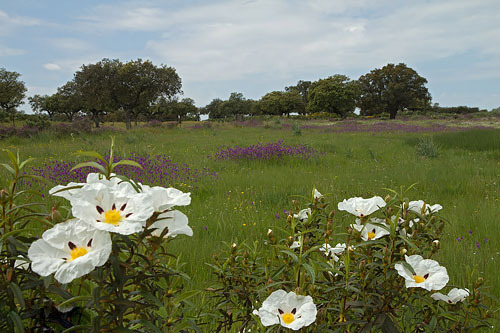 Nature lovers in general are enchanted by the flowering meadows with oak trees, the so called “dehesa”. In spring it may feel like paradise. When you like more open space you can visit the vast steppes and spend the day here without meeting anyone. You can also visit the big lakes, fishing and trying to catch a big barbel. Or take a walk along the empty shores. Wherever you go you will find peace and space. From time to time you can meet a friendly farmer who wants to make a little chat. You can also find different hstorical cities here. Mérida, as a former holiday destination of the Roman Emperors has a rich Roman history which can be found in the amount of ancient buildings. Cáceres has a more Medieval character and Trujillo has a Moorish and Christian appearance. All the cultural heritage is beautifully restaurated. Everywhere in the countryside you will find historic bridges, churches and other different artifacts as well. Even though many people believe the interior of Spain to be bone-dry, this is not the case at all. Extremadura has its periods of rainfall too. The dehesas are covered with a magnificent flower carpet in years of rainfall. There are rivers and streams everywhere. The charcas, drinking pools for cattle, are filled with water. The soil is also rich with water. Many of the water sources give enough water every day to irrigate the vegetable gardens and to provide water for the inhabitants. Because of the huge amounts of water in Extremadura, ex-general Franco has ordered enormous drainage-basins to be constructed to satisfy the need for water in other parts of Spain. These lakes provide drinking water and irrigate the fields.